Kay's father is working late - as usual. Fed up, her mother bundles her daughters into the car and drives to her husband's Cambridge college to collect him herself. But when they arrive, the staff claim that nobody by his name has ever worked there . . . Kay is puzzled by her mot... read full description below. Kay's father is working late - as usual. Fed up, her mother bundles her daughters into the car and drives to her husband's Cambridge college to collect him herself. But when they arrive, the staff claim that nobody by his name has ever worked there . . . Kay is puzzled by her mother's reaction - silent tears, not anger and confusion. And what is even more puzzling is the card on her pillow when they return home- Will O. de Wisp, Gent. F.H.S.P. and Phillip R. T. Gibbet, Gent. F.H.S.P. K.Bith. REMOVALS. That night, Kay is woken by voices at her window- the voices of Will and Phillip, the Removers. But they are not human. And Kay shouldn't be able to see them. Except she can . . .
Andrew Zurcher is Director of Studies in English at Queens' College, Cambridge, and a leading international expert on the works of Spenser, Sidney and Shakespeare. 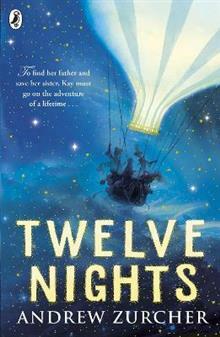 Twelve Nights is his debut novel.